7th and 8th Grade Advanced Class (Invite Only): 7:00 – 8:00 p.m.
High School Boys: 8:00 – 9:00 p.m.
High School Boys Advanced Class (Invite Only): 9:00 – 10:00 p.m. Youth Girls: Thursdays 4:00 – 5:00 p.m.
High School Girls: 8:00 – 9:00 p.m.
Clinics will be up-tempo fundamental workouts. They are designed to focus on reinforcing correct fundamentals for each position, with numerous reps that will help you improve your game at a rapid rate. 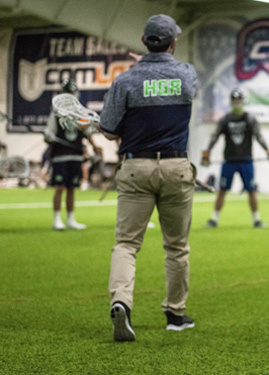 Our player development clinics are designed to rapidly improve a player’s individual skills sets and lacrosse IQ. Players will be grouped by like ability, age and positions to ensure their rate of progression is maximized. At regular team practices the focus has to be on team systems: 6v6 offense and defense, rides and clears, man up and man down. By nature, the individual’s fundamentals cannot be addressed in the detail required to produce big gains in their skill sets. These clinics will do just that. For offensive players, we will focus on everything from shooting form to reading a slide package. For our defense, we run the gamut from approach angles to how and when to throw stick checks. Our focus for goalies runs from pipe positioning to footwork.